Are you ready for Easter dinner? 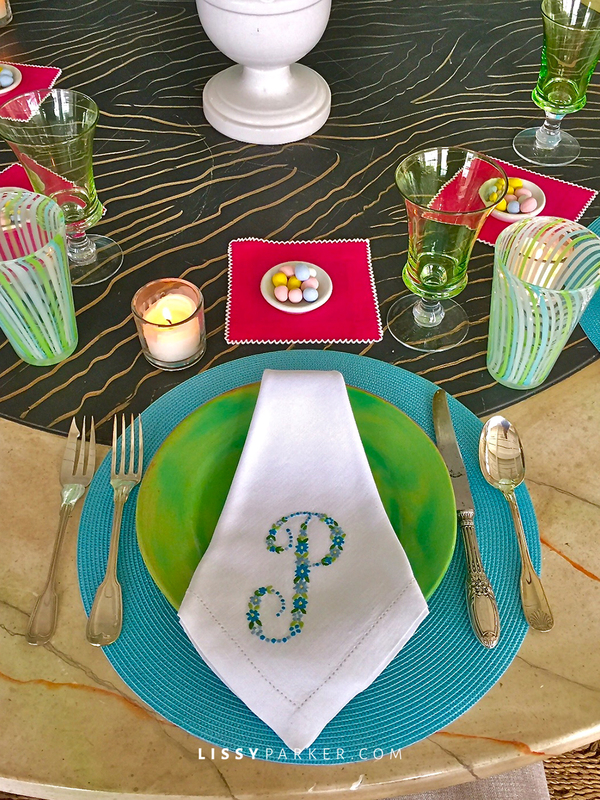 Here’s our colorful table setting for Sunday with antique green plates, aqua place mats, green stemware, Italian swirl glasses and hot pink cocktail napkins. The plates are from Helen Ballard Week’s estate sale featured on the blog here—how lucky to find a set of 12! The aqua place mats and pink napkins are from Erika Reade-Atlanta, Walker Valentine is the source for the monogrammed napkins, the green stemware is from D. B. Jeffries and I found these delightful Italian swirl glasses at C.K. Swan-Highlands. I have a something borrowed here—antique silver from a dear friend. And finally the flowers—you guessed it—they’re from the grocery store! Have a Hoppy Easter! It’s so pretty and fun, Lissy. Love the colors and the flowers…gorgeous! Happy Wednesday! Love the happy colors! Have a great Easter in the mountains! Have a very Hoopy Easter too!